About me, my writing, and my jewelry business. I’m a 29-year-old artist from the mountains of western Maine, I live in a funky apartment in a 180 year old house over an art gallery. My loyal, and not too helpful, assistant is a black and tan coonhound named Daisy. I come from a creative family, as a kid I would spend hours watching my grandfather work in his shop. He would turn a pile of plain leather into the most beautiful, intricately tooled, saddles. He and my mom (who inspired by love of learning and has supported me in everything I’ve done) have been the biggest influences on my life. Most of my writing comes out of my experiences with creating my sculpture and jewelry and then turning it into a business. I started Noadi's Art as a serious business in 2008 after a couple years creating and selling at local craft shows. The internet, and Etsy in particular, have allowed me to sell my work to a much larger audience both in the US and internationally as well as becoming fully self-employed. I haven't had any boss to asnwer to, other than myself, for the last 3 years. 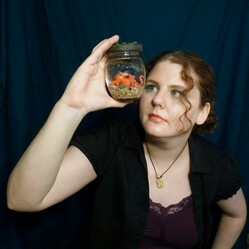 Noadi's Art is my one woman business creating and selling handmade jewelry and sculpture. 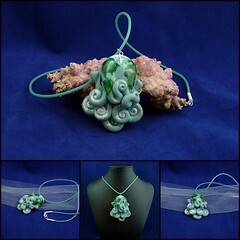 My work is inspired by my love of nature and the ocean, particularly cephalopods. This group of animals, which includes the octopus, squid, nautilus, and cuttlefish, is an almost enless source of inspiration for me. 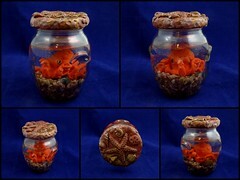 I create most of my jewelry in polymer clay with some mixed media elements such as resin, little glass bottles. and tiny watch parts. They range from big and bold to small and delicate. My sculptures are all of a size that is easy to display in a home or office. The largest of my work for sale is 8 inches tall. Most of it is mixed media with the primary elements sculpted from polymer clay. Fairly recently I've also been dipping my toes into doing more illustrations, mostly of sea creatures and prehistoric animals. I sell the best of these on Zazzle but it's still mostly for fun not profit. I’ve always been fascinated by the cephalopods, especially the Giant Squid, and watching a NOVA documentary on cuttlefish brought them back to mind. They are fascinating, intelligent animals that we just don’t know enough about. They are so distant from us evolutionarily that they might as well be aliens sharing the planet with us. Our last common ancestor with the cephalopods was a brainless, eyeless, invertebrate with only the most rudimentary of nervous systems. Cephalopods independently evolved a complex nervous system, eyes, and a brain. Halfway through a very busy fall. Watch for more about what's been going on. One and only Etsy shop selling Noadi's Art creations. A bit of background about me, Paula Atwell, and what my passions are.